Wooden supports still prop up Casino Notabile on Saqqajja Hill, Rabat, 20 months after The Times highlighted the dilapidated state of the building but help is on the way, according to the Resources Ministry. 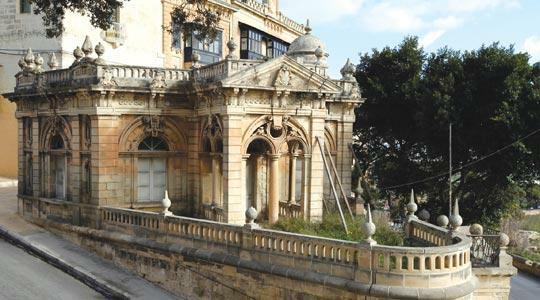 Work to restore the 19th century building, which falls under the jurisdiction of the Mdina local council, has been slow in coming and it was only recently that the structure was included in the ministry's list of planned restoration works. The façade is still supported by wooden beams to stop it from crumbling. But a ministry spokesman said foreign experts would be arriving this week to discuss the prospective restoration. An initial survey on the foundations by architects of the Works Division has already been carried out. "One of the items on the agenda of the meeting (with the foreign experts) is the investigation of the rock structure. "This is necessary for the experts to have a clearer picture of the foundations before proceeding on this project," the spokesman said, pointing out that the biggest problem with Casino Notabile was the foundations. The building was completed in 1887, commissioned by nobles in Mdina as a place to hold social gatherings. It was built by Paulson Webster, the English civil engineer who constructed the Royal Opera House in Valletta. The problems faced by the architectural gem are similar to those that hound the Mdina bastions, according to the locality's mayor. Peter dei Conti Sant Manduca said the foundations were unstable because they were built on clay and were the cause of the deteriorating state of Casino Notabile. "As a council we want the place restored and are pushing the government to get the work done. But it is not a cosmetic touch-up and so requires substantial funds," he said, adding the council was carrying out regular maintenance work to avoid rainwater leaking inside. The problem with the foundations had to be solved before any restoration work started on the façade, Mr Sant Manduca said, insisting the wooden beams gave the impression of a place that was in a much worse state than it actually was.